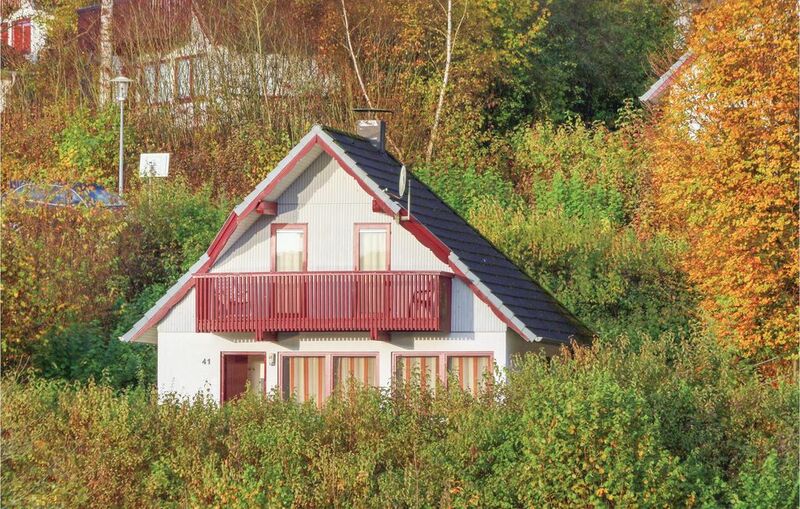 Your house is located in a well-kept holiday home park in the North-Hessian highland. The holiday home plots are surrounded by their own lawns, which houses modern and comfortable. You will find three separate bedrooms, two of which are equipped with a double bed. In the third room has two single beds. The house has a night storage heater. The leisure facilities in the plant and in the nearby area (for an additional fee) ranges from a children's playground and trampoline, beach volleyball, jogging path, hiking trails to a wakeboard and water-ski. The lake offers a beautiful beach, and just as inviting for swimming as for fishing. The local hotel offers a restaurant and a lakeside terrace. Our quality cottage guests can use for a fee and pool of the neighboring hotel sauna. On the 4 km away, the golf course Our quality guests receive discounts on green fees. Bike rental on the spot. Nestled between Knüllwald and Fuldatal right in Nordhessichen Bergland Little Red Riding Hood country. The name recalls the home of the Brothers Grimm and belongs to the German Fairy Tale Road. Numerous well-developed hiking and biking trails invite you to explore the cultural and natural, the railway cycle path Rotkäppchenland, Schwalm Bike Path and the Fulda bike trail. Characteristic of the Little Red Riding Hood country is also a variety of museums that give excellent insight into the history of the country and in numerous special features. Among the necessarily recommended trips also owns the only 15 km from Bad Hersfeld, which welcomes its visitors with a great half-timbered Old Town and numerous spa, culture and things to do. The Stiftsruine is considered the largest Romanesque basilica north of the Alps and today is the largest Romanesque church ruins in the world.